My husband often asks me, “Do you really get new ideas from hearing other trainers speak at seminars and conferences? How much more can there possibly be to learn about how to be a better dog trainer?” After having been married to me for the past 11 years, he fully understands that the field of animal behavior is constantly evolving and changing, but he’s asking about how many ways to train a dog, and whether or not they’re similar. It’s a valid question. My answer, of course, is that like most good dog trainers I know, I’m like a sponge trying to soak in as much knowledge and learn as many novel approaches to dealing with both dogs and their humans as I can. Most people know that I’m a fierce opponent of aversive, punitive methods based on human dominance/animal submission methodologies, but as long as one approaches the field of dog behavior from a starting point of working with the dog to build mutual trust and respect, science has shown us that there are countless valuable, effective and humane ways to train dogs. As is the case in most professions, however, it’s not very often that we’re able to come up with a truly novel approach or tool that makes a real difference in how we solve a particular problem. 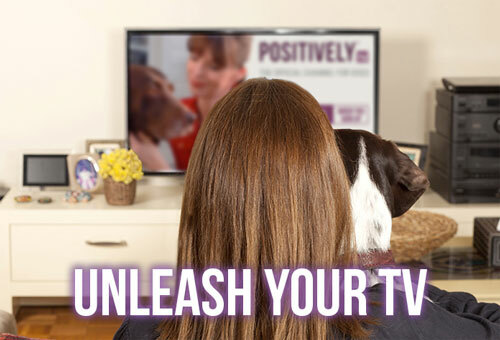 That’s why I’m so excited to announce the official launch of what I believe will be a real game-changer in how we deal with the problem of anxiety in dogs – the Canine Noise Phobia Series. 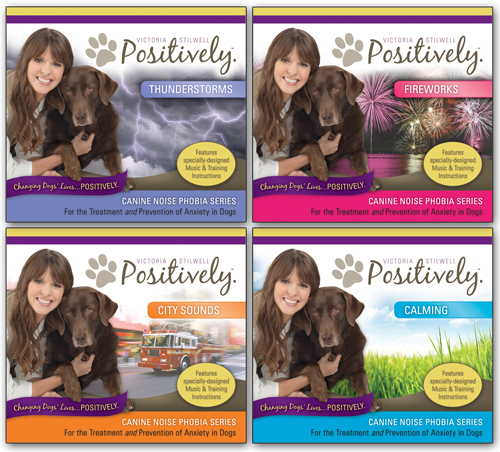 The Canine Noise PhobiaTM Series (CNP) is a groundbreaking new desensitization tool I developed in an exclusive partnership with my friends from the well-known Through A Dog’s Ear canine music series. The concepts we’ve worked with while creating CNP have never been used in this combination before, making this a first-of-its-kind tool to make our dogs’ lives better (not to mention our own!) The first three volumes include Fireworks, Thunderstorms and City Sounds – all of which are specially designed to help dogs overcome their fear of those particular sounds. A fourth volume – Calming – is also available to reduce general dog anxiety. Here’s how it works. We first build a positive association for the dog with some of the beautiful psychoacoustic music from Through A Dog’s Ear. Once the dog is in a relatively calm state, a different music track begins to play while softly introducing the offending sound (thunder, for example) underneath the music. During this time, the owner is providing a positive environment for the dog using favorite treats, play, praise, etc. When the dog is suitably nonplussed by the faint thunder sounds, they graduate to the later tracks which feature progressively more intense sound effects alongside the calming music. The combination of psychoacoustic calming music with positive reinforcement protocols that are introduced while the offending sounds are playing, results in a dog that can eventually experience much lower levels of anxiety during thunderstorms, fireworks or city noise. 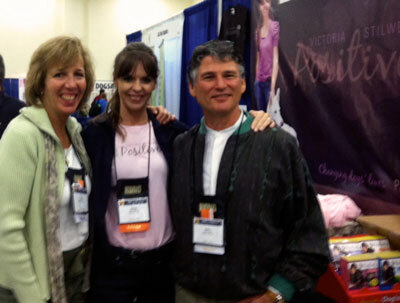 From left: Lisa Spector, Victoria Stilwell, and Joshua Leeds: co-creators of the Canine Noise Phobia Series. There are a lot of noise desensitization recordings available in the market, but until now none of them has utilized the power of specially-designed psychoacoustic music while initiating the desensitization process. That’s what makes CNP so special. And what makes it even more unique is that this is the first desensitization tool that is actually designed not only to treat existing noise phobias but to also help prevent them from ever occurring in otherwise non-noise-sensitive dogs. I met Lisa Spector (the Juilliard-trained concert pianist and co-founder of Through A Dog’s Ear) almost a year ago at the Clicker Expo where we started discussing ways we could work together to bring my training philosophies and her canine music experience together. Along with her Through A Dog’s Ear co-founder and psychoacoustician sound researcher Joshua Leeds, we spent the better part of the summer working together to develop the Canine Noise Phobia Series. I am amazed at the wealth of fascinating information I’ve learned from both of them, after hearing Joshua speak during the recent APDT conference about how dogs experience the world aurally, I’m even more excited to get started on the next phase of the CNP series. For now, though, I’m thrilled to announce that the Canine Noise Phobia Series is now available to purchase on the Positively website. The feedback we’ve already received from trainers who got their copies at the APDT conference has been fantastic, and we’re sure that CNP will help all those whose dogs suffer from anxiety from noise triggers as well as the stresses of everyday life. Please give us feedback about your experience using CNP by visiting www.CanineNoisePhobia.com – we welcome your thoughts! The series is available to purchase as individual CDs or as a complete, discounted 4-CD set. The Canine Noise Phobia Series homepage.